I wanted to take the time to address this article, although I do not know this author, anyone that has been following this “speculation” can see where he is off base concerning many of his comments. Even the top notch “traders” are investing in emerging markets over sea’s because in many cases are far more favorable than US stocks. Some US stocks pay 2%-5% dividends, stocks that pay any higher than that are pretty risky in my opinion. We have all seen some major companies go out of business altogether, (Hostess to name one) and many of the “green energy”, “solar”, “battery tech” etc, stocks decline significantly in recent years and many of those go out of business all together. Tesla motors on the other hand, has had huge gains, one college student spent his life savings of about thirty thousand dollars and his stock is now worth over a quarter million. There is an exception to every rule. Depending on your financial situation, should dictate to each individual, what is best for them, like fixed income people to name one group. Others can put on some added risk for even greater gains without risking their retirement or way of life. In my opinion, to make a blanket statement that you are better off to “invest in US stocks” does not apply to everyone. The figures that were stated in his article are not current at best, you can buy a million Iraqi dinar for about one thousand dollars and if need be can be sold back to a dealer for around eight hundred dollars, maybe a little more or less. I suspect this will change as many international banks are setting up shop in Iraq, like JP Morgan, Citi bank, etc. That being said, there are about 32 Trillion “New” Iraqi dinars in circulation now, how many Iraqi dinars held outside the country of Iraq is up for debate, however, if you take the total number (assuming the CBI holds 20% as required) that leaves about 25 Trillion Iraqi dinars outstanding or in other words, what the CBI is responsible for backing. If it RV’ed straight across ( no deletion of zero’s), at 1 to 1, Iraq, the CBI would be responsible to back 25 Trillion dinars or in this case dollars. In this scenario, Iraq would be in debt for 25 Trillion dollars to back their currency, (assuming we all wanted to cash in now). 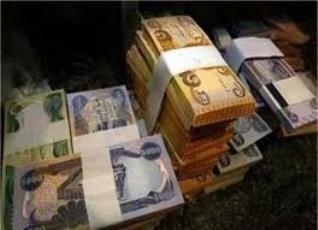 It is up for debate as to how much Iraqi Dinar all the other countries hold, including their governments, but we know that the CBI’s daily auctions are selling the dollar and taking in Iraqi Dinar. They may hold a significant amount more than we know of, which reduces the amount that they have to back, and offset their debt to exchange. The more they retain the less they are responsible to back and the more it increases their holdings of the dinar…. Make sense? This is why no one knows exactly what they WILL do, all kinds of articles, statements etc on what they are discussing, but NOTHING definitive. In my opinion, the worst I can get is about a 200%-300% return and here is my thinking: If they remove/delete the 3 zero’s as some have surmised, then it MUST be from the rate and the physical notes at the very same time, if you remove the “preceding zero’s” as stated in many articles, the ONLY preceding zero’s are in the “rate”, which is currently .0008576, that would leave .8576 (almost .86 cents). If the zero’s are removed from the notes at the same time, it would reduce the currency in circulation from 25 Trillion to 25 Billion. What was Saddam’s rate and currency in circulation? It is stated above. In my opinion, it paves the way to back to the $3 dollar rate as it was before, maybe even a little higher. In summary: If I paid $1000 dollars for a million Iraqi Dinar it should be worth about 3 thousand dollars sometime in the future. Beats the heck out of a 5% dividend rate…IMO? I could go on and on, both in support of this speculation and against it, but I remain hopeful that I have chosen a viable option to make my money work the most for me and my family. Just a note here, I’m not a person that promotes or encourages others to speculate as I have, but I will say this, there are a few that do just that, when they themselves do NOT have any significant holdings in the Iraqi dinar. I do have a significant amount of money speculated in this and I hope for the best..backed by facts, not some guru’s unsubstantiated opinion. As you all can see, we do not have a “donate” button or tab, we do not ask our members or guests for 1 penny. All of our site is open to everyone, we do not have “locked” forums or pages that require registration and being logged in to view, we do not charge anyone for a “VIP” membership to get “inside” info. I hope you will all continue to visit our site and get the latest information/news on the Iraqi dinar. This is not my opinion. Removing the 000 or deleting the 000 notes means removing them from circulation by changing the value so that the value is high enough that Iraqi people can use the lower denominations and do not want to use the 000 notes anymore. Changing the rate to .86 or 1.17 will compel the 000 notes to be recovered by the CBI from circulation because everyone in Iraq will then be able to use the lower denominations (coins & smart cards, etc.). They can then trade in their 25,000 IQD notes for hundreds of the 250 IQD notes, for example. You seem to be confused by thinking that deleting the zeroes is something other than changing the rate to .86 – 1.17, and then revaluing to the real market value of just over Kuwait’s. This same explanation is published via all the credible news sources, including XXXXXXXX, XXXXXXXX, XXXXXXXXX, XXXXXXXXX, etc. It’s nothing new and NOT MY OPINION, this comes from the CBI and IMF published policies. OK, one more time, Many articles over the years have stated “delete the 3 zero’s from the currency or notes”, while other have stated “delete the zero’s from the nominal rate”. Which is it? They are obviously very contradictory at best. I will say this again, I am not saying that this is what they intend to do, simply that they have left that option on the table, no one can dispute that fact. I am also saying that they could mean to “remove” the 3 zero notes from circulation just as you have stated, that option is still on the table as well, I agree with you on that. You stated: “You seem to be confused by thinking that deleting the zeroes is something other than changing the rate to .86 – 1.17″. Deleting or removing the 3 zero’s from the “nominal rate” is just as you stated as to how the .86 rate came about. Example .0008576, minus the 3 zero’s, is .8576, or just about .86, people have just rounded it up to .86 cents. Depending on how you look at it, to use your numbers, .86 USD would buy #1 dinar, that makes the USD have a higher rate than the IQD, on the same hand, if $1.17 USD would buy #1 dinar, that would make the Iraqi dinar have a higher rate or value than the USD. The nominal rate is is in USD, so .86 USD would in fact buy #1 dinar. In other words, if you have 1 million IQD, it would exchange for $860,000 USD…right? (using your analogy). It would not be worth $1.17 million or $1,170,000 USD. I XXXX’ed out the websites you named as I won’t promote other sites. Keep in mind that some of the sites you named are full of pumpers stating rates at $36.87, which is absurd. Please provide links to the “IMF and CBI published policies” you speak of. I know that we have posted articles stating that they want to make it 1 to 1 with the dollar, or there about’s, we also have posted articles that state that they want to “restore” the dinar to it’s former value of about $3+ dollars. This is where the discussion is, what will they actually do? One more thing, you could look at it this way too, $1.00 US dollar would buy 1.17 dinar, and the exchange rate, or nominal rate would be .8547 USD. (1 divided by 1.17 = .8547) which is the same as .8576 USD buying #1 Iraqi dinar note, (give a few hundredths of a penny). I want to state again that we are entitled to our own opinions based on what we know and have learned, whether it is based on facts or “sources/contacts”. I personally choose factual information and not rumors. Just to be clear, there are many possibilities stated, they could RV at .10-.20-.50 or .86 cents, they could remove the zero’s or “lop”, they could “float”, or they could just put the rate back to what it was at $3+. All these options are still on the table, that was my point, no one knows. Hmm, are you saying that .0008576 = .8576? Because if I subtract them I don’t get 0, I get 0.8567424. Removing the zeroes from the NOTES at the same time you change the rate is meaningless because the 000 notes will still be recognized. So just deleting the zeroes will produce close to $25,000 USD for a 25,000 IQD note. Your “IE” which I think you meant as “e.g.” is not mathematically correct. 30,000,000,000,000 = 30 Trillion written in numbers, now if you remove 3 zero’s from that 30 Trillion number, it is then 30,000,000,000 = 30 Billion. Lets get back to the scenario now. When Saddam was in power he had about 25-30 Billion old dinars in circulation as stated by many articles/reports and the rate was about $3 USD, (some say the rate was higher than $3 in country and was valued less outside the country at about $2.47 USD.) For sake of complicating this I rounded, or am using $3 USD as an average rate. Using the 25K note example stated above that is worth $21.50 after removing the 3 zero’s from the rate and the physical notes, if they raise the rate back to what it was at about $3 USD, as has been stated in many other articles, then that 25 dinar note at $3 USD is equal to $75.00 USD. 25 dinars X $3.00 USD = $75.00 USD or about a 300% increase in value from the original purchase price. I am not saying that this is what Iraq is going to do, but this is one possible theory that has been stated for years now, that benefits the Iraqi citizen and the Government of Iraq by reducing the money supply in circulation. Another possible theory is to just remove the 3 zero’s from the current rate and NOT the notes, that would make #1, 25,000 dinar note worth $21,500 USD. 25,000 dinars X .86 = $21,500. That is what I tried to explain in my first comment, I thought that people were more aware of the facts and did not go into every detail. I hope this helps explain in detail so that everyone can understand. It is also possible that they could do a straight across RV at $3 USD, which would make a 25K note worth $75,000 USD. This is why we try to follow this so closely to try and figure out or understand their intentions and what will be their ultimate decision, fact is, no one really knows what they will decide until they do. This presupposes a “lop” and it’s clearly not the CBI’s policy to “lop” or diminish the value by 1,000 times by “lopping” the zeroes off like they did in Turkey, which had disastrous results. Once the rate changes to represent a real market value, we can expect the IQD to be slightly higher than the Kuwaiti Dinar. That is, in USD:IQD terms, 1,000,000 IQD would be worth 1,000,000 x 3.50 USD for example, or $3,500,000. Please review my earlier post to see how the value will change according to long standing and current IMF and CBI policies. Remember also that once they “delete the zeroes”, meaning remove the 000 notes from circulation, your 25,000 IQD note will be worth one hundred 250 IQD notes. They certainly will NOT make a 25,000 note worth only 25 IQD. That would destroy their economy and probably lead to more wars. Again, please re-read my comments, that is NOT what I stated. ort99, You are certainly entitled to your opinion and we welcome it here, but I beg to differ on many of your points. If you will re-read my prior comment, I think that you will understand the scenario that I described. You missing an important point, it would NOT decrease the current value of the dinar by removing the 3 zero’s from the rate and notes at the same time, it remains exactly the same value. The math doesn’t lie. Using your statement “diminish the value by 1,000 times by “lopping” the zeroes off”, that would be accurate if they removed the 3 zero’s just from the physical notes and not the rate as well. Example: .0008576 X 25 dinars = .02144 USD. I know for certain that they would never do that. Also, there is no credible statements/documents/articles or reports that it will be valued close to the Kuwaiti dinar, absolutely none. How does that even make sense? Kuwait has a great infrastructure, a solid Government, a strong banking sector and most importantly, they only have about 25 Billion Kuwaiti dinars in circulation that they have to back or “cover”. If Iraq RVed at $3 USD, X 30 Trillion Iraqi dinar, it would put Iraq in debt to the tune of 90 trillion USD to back or “cover” their 30 Trillion IQD that is reportedly in circulation. That is fact. I want to make this very clear, I am NOT stating that I know what Iraq is going to decide, just mentioning possibilities as has been reported for the last 8 years. How could a million Dinar equal only three thousand dollars if the rate changed to 86 cents? If you had a million dinar and the rate was .86 USD to 1 IQD, you’d have $860,000. That rate is not realistic or sustainable for many reasons, and we can expect rate just a bit higher than Kuwait. You can also expect Kuwait to bump up it’s rate, possibly and probably leaving us with a revalued exchange rate of around $4.12 to 1 IQD. That would make your $1,000 investment worth 4,120 times greater, now wouldn’t it. ort99, If you remove the 3 zero’s from the physical notes and the rate, (.0008576 currently) simultaneously, it remains the exact same value as it is now, we have gained nothing nor have we lost anything. However, if after the “deletion/removal” of the 3 zero’s as stated above and they raise the value of the Dinar back to where it was pre-war, which was about $3 bucks, then you have your answer. IE: A 25k note is worth about $25 dollars right now, remove the 3 zero’s and raise the rate to $3 dollars, and the same note is worth $75 dollars. This is a rough explanation, but I think the point is made.